DETROIT – Former Detroit Public Schools CEO Kenneth Burnley, Jr. and current Emergency Financial Manager Robert Bobb have enslaved the Detroit Public Schools to the Bank of New York Mellon by borrowing hundreds of millions of dollars. 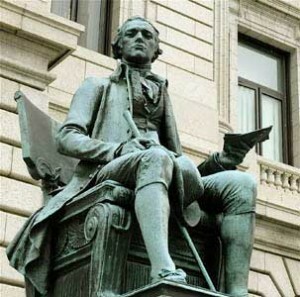 The Bank was founded by slaveowner Alexander Hamilton. The debt is expected to rise to $523.8 million by 2011, or 90.7 percent of state per-pupil aid for that year. This year alone, DPS debt of $438.8 million amounted to 71.2 percent of state per-pupil aid. “The Emergency Financial Manager was supposed to eliminate the $219 million DPS deficit when he came in,” said CPA Greg Frazier, formerly Deputy Auditor for the City of Detroit, who also filed and won a Freedom of Information Act request for DPS financials for 2006-07, in conjunction with community organization Call ‘em Out. The Bank of New York Mellon (BofNYM) is the nation’s oldest bank, with $23 trillion in assets. The Bank of New York was founded in 1784 by Hamilton, and merged with the Mellon Corporation in 2007. The Mellon family is ranked number five by wealth in America’s 60 Families. 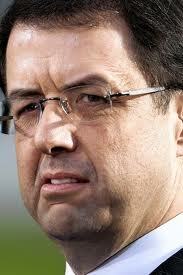 B of NYM is also custodian of the government’s $700 billion Troubled Assets Relief Program (TARP). It was paid $20 million in fees to manage the program, and further benefited by selling $3 billion of its preferred stock to the federal government under the program, according to Bailout Sleuth. It has since repaid the $3 billion. Its CEO Robert Kelly is notorious for objecting to proposed restrictions on bonuses paid to top executives of the bailed-out banks. It also has ties with Chase Bank, one of the nation’s foremost culprits in massive foreclosures. In 2006, J.P. Morgan Chase & Co. announced they would swap their corporate trust unit for Bank of New York Co.’s retail and small business banking network. TARP has doled out billions to bail-out the nation’s largest banks, which in turn have done virtually nothing to stem the nation’s Katrina of foreclosures. Foreclosures in Detroit have drastically reduced another source of school funding, property taxes, which accounted for $75.4 million of DPS cash receipts in 2009-2010. The excessive DPS borrowing began when former schools CEO Kenneth Burnley, Jr. first purchased $210 million in “deficit reduction bonds” guaranteed by state school per-pupil payments in March, 2005. Monthly letters from DPS Chief Financial Officer Ricardo Kisner and Chief Accounting Officer Delores A. Brown on the DPS website confirm this. State law had to be changed to resurrect such “deficit reduction bonds,” which had been outlawed in 1994, according to a 2004 memo from Gary Olson, then director of the Senate Fiscal Agency. Since state Emergency Financial Manager Robert Bobb took over, the district has borrowed untold millions more. Notes dated 2009, 2010, and 2011 account for $515.5 million of $523.8 million debt set-asides for 2010-2011. “The state is deliberately starving the school district by freezing state aid and sending it to charter schools, while Bobb is covering it up with more borrowing, as Burnley did,” Attorney George Washington, who represented the Detroit Board of Education in its successful fight against a mayoral takeover, added. While it is busy cutting funds to Detroit’s children, the Bank of America has been embroiled since 1996 in a $7 billion money-laundering scandal involving a top executive and a Russian bank that collapsed as a result of the transactions, according to articles in the New York Times. But, said the Times, “. . . corporations are legally liable for the actions of their officers, and now that the two suspects — a former bank vice president, Lucy Edwards, and her husband, Peter Berlin — are cooperating with prosecutors the stakes have suddenly risen for the bank.” Edwards and Berlin eventually pled guilty and got probation with restitution, but the case is still ongoing. In 2008, after the B of NY and Mellon merged, Russia filed its own $22.5 billion lawsuit against BofNYM its’ citizens losses. Richard Scaife is heir to the Mellon fortune.